A lot can go wrong on a night out drinking with friends—incarceration, questionable taste, the realization that you lost half the group two bars ago—but all of these things can be avoided with the right tools loaded in a smartphone. With these 13 apps, you will have full cups, manageable chaos, and a reasonable chance you'll recognize the room you wake up in. 2. You're better off taking your friends' word for it on Foursquare for iOS, Android, and WinPho. You can find your crew if you haven't already linked up, or try a new place based on a word-of-check-in recommendation. 4. Maybe you're meeting up for a drink at a friend's house before the night really gets going. That's when you need Mixology for Android or iOS. This app's standout feature is "liquor cabinet," which allows you to punch in whatever you have on hand, and it'll come back with all the cocktail options based on your ingredients. 5. If you're shopping at a well-stocked beer store—or you're lucky enough to find yourself at a bar with two dozen microbrews on tap, you may be paralyzed by an enviable paradox of choice. You need Untappd, for iOS or Android. It's basically a Yelp for beer. You and your friends rank and review all the different brews you try, and you end up with a nice database of favorites. 6. The beginning of any drinking game signals that the night is taking a sharp turn. 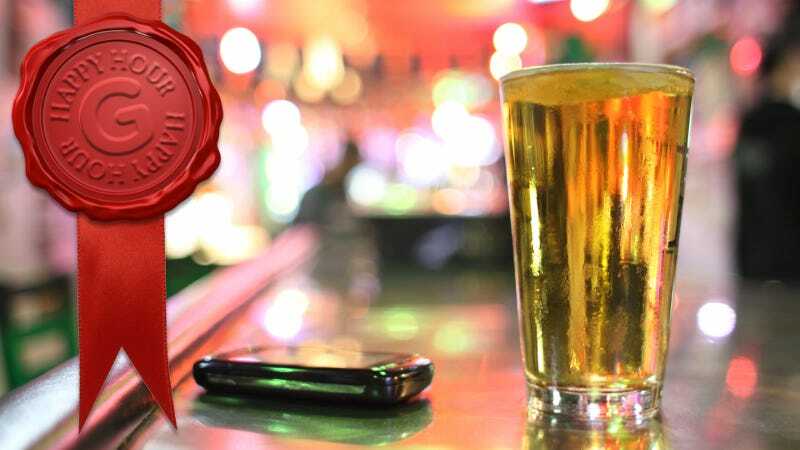 There's not a clear king of the drinking game apps for both iOS and Android, but most of them have a lot of rules to a lot of drinking games. For Android, 101 Drinking Games includes digital dice, cards, and coins, so you don't need any of your own stuff. That's a good thing. 7. For iOS, there isn't a definitive best drinking game app, but the standby Drinking Games is a good bet. 9. For a BAC calculator on iOS, there's R-U-Buzzed, which is made by the Colorado Department of Transportation, so that's kinda official? A disclaimer from the Colorado DOT: "This blood alcohol concentration (BAC) calculator is only an estimate and is not sufficiently accurate to be considered legal evidence." Got it? Fun at parties, but not reliable (like so many of your friends). If you have the slightest bit of doubt, don't drive. 11. Calling up your ex, you drunken sot, is a horrible idea you will regret in the morning. Luckily, there are apps that can prevent you from doing that by blocking outgoing calls and SMS to certain numbers for certain periods of time. For iOS there's Drunk Dial NO! ($1). 12. For Android, go with Stupid Phonecall Blocker (free). Seriously, it's a stupid phone call. Go watch SportsCenter. 13. When you're going out drinking, there are so, so many ways to end up in jail. If you find yourself face-to-face with the cops, maybe it's time you take a look at the I'm Getting Arrested app for Android (free). It contacts a pre-set list of friends with the news: I'm getting arrested! Y'know, just in case.